They were beautiful. They were powerful. They swam just under the surface of the water almost as though they were trying to give us the best view they possibly could. I don’t know why they’re called great white sharks, as they’re mostly grey all over. We were on a boat called Shark Fever, in the waters of Shark Bay, 20 minutes off the coast of Kleinbaai, which was a 2-hour drive away from Cape Town. This is the shark capital of the world. My friends and I, a trifle seasick, were about to get into the water with some very big fish. We had arrived at the meeting point, Great White House, a couple of hours earlier and checked in, arming ourselves with a disposable underwater camera purchased from the attached gift shop. Lunch—which was part of the package—consisted of a soggy hamburger with our choice of tea or coffee. After eating just enough to stop our stomachs from growling, we were herded upstairs, where a slide show of fantastic photographs and factoids about great white sharks awaited us. Alison Towner, the leader of our trip, talked us through it. 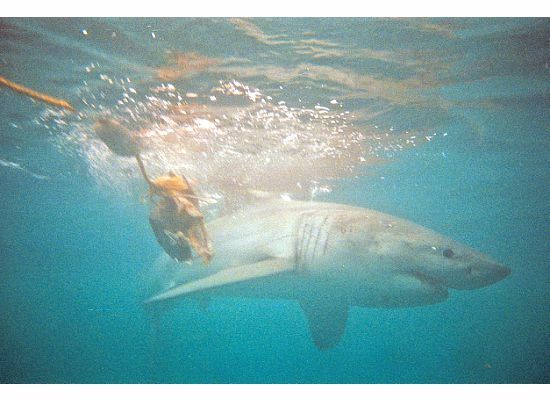 A British marine biologist, Towner was collecting data for her research on great whites. Every trip undertaken by Marine Dynamics, the tour operator we used, enables her to gather information on these mysterious creatures, and the money they generate helps fuel their shark conservation trust. It was the prime factor that helped us choose this company over myriad others that service the Cape Town area. We learned about the transoceanic migration habits of the great whites. 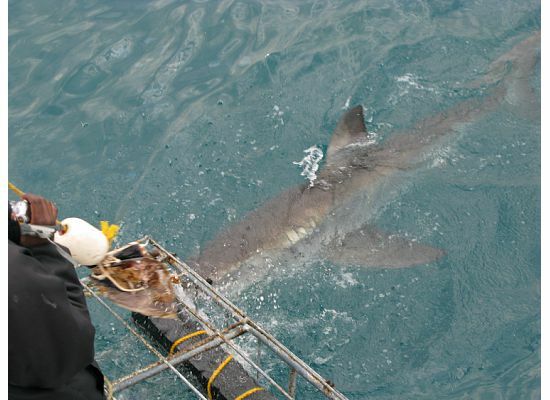 Even if there were repeat customers among us, we were told that there was little to no chance that they would encounter the same shark twice, as they migrated long distances—all the way from the Western Cape of South Africa to Australia, roughly 10,000 km one way! This spot was merely a pause, where they fed off the abundant seal colony on the nearby Dyer Island and replenished themselves for the demanding journey ahead. Towner took us through what we should expect on board the boat and admonished us to “keep our hands and feet inside the cage at all times—you’d be surprised to find out how many people forget to do this.” Giant, pointy teeth, easily torn human flesh, keep the two apart—got it. The six-person cage was long and thin. Towner assured us that just the previous week, “we fit six large rugby players in there, comfortably.” There were strips of black rubber on the inside of the cage at hand and foot height, and yellow railings to hold on to. The cage was attached to the side of the boat (“don’t worry, it has never floated away”), with the top above the water. We had to hold on to the railing, heads above water, until a member of the crew spotted a shark heading our way. Then we would duck our heads and hold our breath and watch it swimming a few feet away from us until we had to come up for air. It was my turn. I flip-flopped awkwardly over to the cage, and dropped into the water. It was early September, and winter lingered in the water temperature. As one, my fellow divers and I took a deep breath and plunged our heads underwater. There she was. One of the larger females we had spotted earlier, longer than the cage even. She was swimming from my left to right, and she passed right in front of the cage as though putting on a show. Her right eye was round and black and she looked right at us for half a second, these strange black rubber-clad creatures with ungainly limbs who splashed too much, and her tail flipped the end of the cage, playfully saying hello as she moved out of sight. The murky blue water closed over her and I stayed down a bit longer than everyone else, hoping to spot her again. We saw young juvenile males—all sharks less than 10 years of age are called juveniles—and older females. One curious male head-butted the cage just as it had been attached to the side of the boat. No one was in the cage then, just a severed fish head dangling as bait inside (perhaps it was at that moment that the older Indian couple on board decided against getting in the water. It didn’t faze their son, who took two turns). One female shark had an injured dorsal fin. The team recognized her, and knew that the injury was recent. They thought it might have come from a clash with a boat or trawling lines. The flesh looked red and rumpled and raw, the tip folding to the side like origami gone wrong. I couldn’t get the image out of my head. In the briefing session, Towner had taken us through a slide show about the sharks we were about to see, ending it on a startling statistic: Humans kill about a million great white sharks a year. 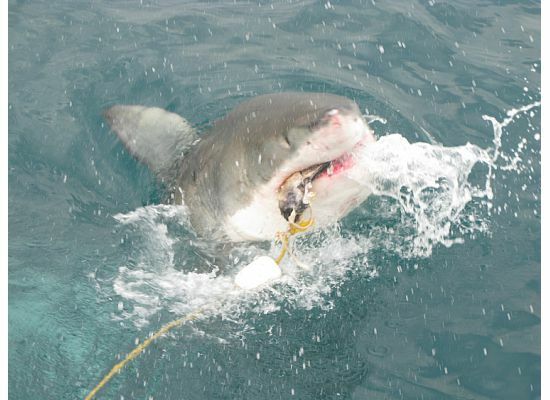 The great whites cause a handful of fatalities in the same period. Who are the real predators? As we powered our way back to shore, I pumped Towner for more information about the creatures I was lucky enough to see in their natural environment. How long did they live? How big did they grow? What did they eat? Surprisingly, she couldn’t answer all my questions—too much remains unknown about these saltwater giants. I hoped that our trip helped her find one more piece of the puzzle. And I knew that Jaws would never have the power to scare me ever again. This article was published on 10 December 2010 in the Indian newspaper, Mint.